When you come home every night during the week after a long day at work, after you prepare and eat dinner then eventually put the children to bed, what do you watch on television before and after the late night news? I live in Chicago and by nine at night here during the week I’m definitely sitting in front of the TV either watching sports or some show before I watch the news at ten. It’s that perfect time to wind down after a hard day at work, to just veg out a bit. I don’t have children, but I do enjoy taking the time to relax and watch the tube before I get ready for bed. According to the New York Times, there is a “revolution” taking shape in prime time that will kick off in September and it has to do with “The Tonight Show’s” Jay Leno. 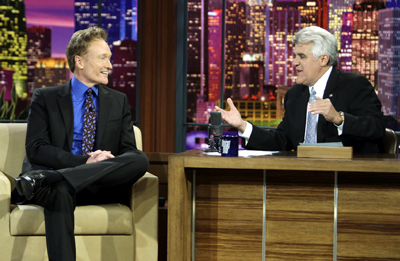 This Monday, night Conan O’Brien officially takes over NBC’s “The Tonight Show.” In September, NBC is planning to move Leno to his own talk show called “The Jay Leno Show,” which would air at nine p.m. Central time. All the hype is that never before have late night talk shows aired during prime time spots where television dramas usually dominate. Does Leno have the following to make such a new move work? If this doesn’t work out, then NBC will have to fill five prime-time hours a week. Some in the industry think it’s a bad move. But others say a low-cost talk format like the Leno show is changing the face of television rather than high budget typical dramas at that time slot. I wonder if the economic crisis has anything to do with this? You think? Many workers in the field have a lot at stake, including Hollywood production studios and the writers, directors and actors, says the Times, who keep the entertainment engine humming. Then there is cable. Cable channels are hoping that their programs and one-hour dramas will have a better chance going up against Leno, even if they’re repeats. Yet NBC claims that viewers have expressed high interest in watching Leno earlier in the evening. They say also that they can afford lower ratings, if that happens, because it will cost one-fifth as much as an hour-long drama. Even more interesting, some point out, is that most people tend to watch TiVo during the time the new Leno show will air. TiVo is a handy program that digitally records shows when viewers are not in a position to watch them when they originally air. I haven’t gotten it yet, but I hear it’s really useful, especially if you’re too busy to keep up with your favorite shows or sports. So folks tend to catch up at the end of the day. Come to think of it, I don’t generally watch many television programs at nine at night other than what’s on cable or sports. I just can’t think of anything that’s really good on the square box during at that time during the workweek. Back in the day, I did watch NBC’s “ER.” But then it got old and it aired its final episode a couple of months ago. Personally, I was never really into late night talk shows except for the “Arsenio Hall Show” back in the day. I remember we loved that show in my house growing up. Talk about a revolution, a Black late night talk show host? Since the end of that show the demographic of late night hosts hasn’t budged much. And I probably prefer David Letterman, if I had to choose between the new and old gentleman’s club. Conan is kind of funny though, I have to admit. But honestly the concept of a talking head giving a monologue behind a curtain and interviewing famous people is getting rather old. The late night talk show idea needs to be spiced up a bit and resonate better with younger viewers that are culturally and technologically savvy, at least when it comes to the iPod and Facebook generations. At least cable has Comedy Central. If I didn’t have cable, my options on television would certainly be limited and I might just gravitate to the Leno show. During these tough economic times I am certainly not advocating cable, trust me the bills mounting each month are hard as it is. But for sports, well, cable is a must for me. If you ask me, the nine at night hour on television is one of the most important time slots each and every day. It would be great to sit back and tune into something worthwhile that’s for sure. So who knows, maybe Leno will work out. We’ll just have to wait and see. If not, well I always can fall back on sports.